Knocking Crosswater Golf Club off my list of Top 100 Public Golf Courses was a pretty special one for me, actually. Growing up, my family had a house in Sunriver, and so every summer and winter I’d spent at least a week or two enjoying sun, snow, biking or hiking. It’s funny, I’m so into golf now, because I’d never played any of the Sunriver courses until recently. This was a slightly impulsive trip as well. 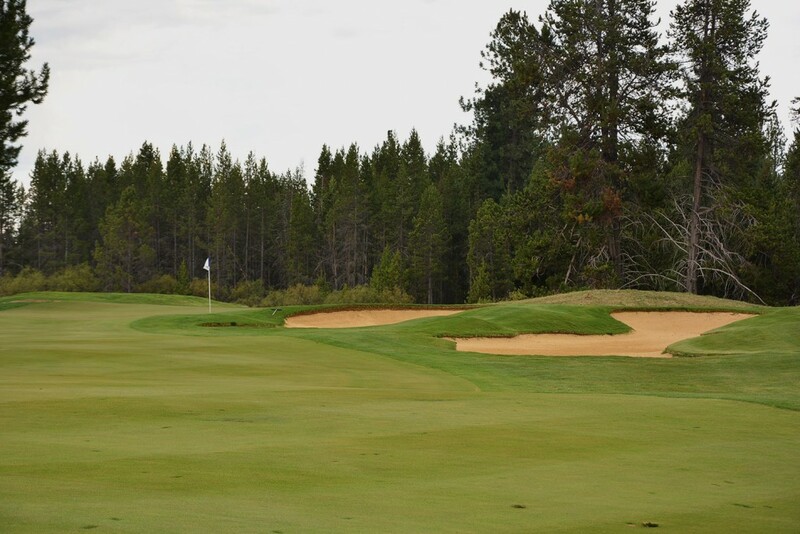 Sunriver Resort had this unbelievable deal, where for $99/night you got a room at the lodge, and unlimited golf – including one round a day on Crosswater which is #48 on the Top 100 Public Courses. I’d played the Meadows course a couple times, but Crosswater was always out of reach considering you have to either be a member of the club or a resort guest to play – and even then the $150+ greens fees made it a bit cost prohibitive. So, I grabbed my two best golfing buddies and got in an unbelievable 4 rounds in 3 days – 3 on Crosswater and 1 on the Meadows course. Total cost? $200. How can you not take advantage of that? Earlier in the week I’d played Cog Hill Dubsdread outside of Chicago , so I was pretty stoked to get two courses crossed off in the same week. That being said, these courses could not be more different. As we pulled into Crosswater we were backing up traffic (aka, the one car behind us) driving slow as we took in the breathtaking scenery of wetlands, Mt. Bachelor, and one of the most well manicured golf courses you’ll ever find. Crosswater was built in 1995 and is a Heathland style layout by Robert E. Cupp. From the Gold Tees it comes in at a staggering 7,683 yards, essentially making it the longest course I’ve ever heard of. One of the most respected courses in Oregon, Crosswater has been host to the Jeldwen Tradtion, a Champions Tour Major, the NCAA Division 1 Championship, and this year will host the PGA Professionals National Championship – which it also hosted in 2001 and 2007. With Dubsdread being my most recent frame of reference, I wasn’t totally sure what to expect. That course was in great shape, but the facilities and the scenery weren’t quite what I was expecting – it was very clear that I was at a public course. Crosswater was the exact opposite. From the moment we pulled up and the guys grabbed our bags, it was obvious we were in for something special. Heading out to the driving range we were treated to what was probably the finest range I’ve ever had the pleasure of hitting balls at. The pins were extremely well manicured, and the turf was in great shape. It didn’t hurt that they had unlimited Titlest NXT Tour balls for practice use – not the Pro V1s of Pronghorn – but these were probably better for my game anyway. Throughout our 3 rounds the course never got old, in fact I found myself liking it more and more each time I played it, as I learned the nuances of each hole. Considering I got to know the course pretty well, I’m going to give a brief hole by hole tour – along with my thoughts on how it played, what I liked, and the very little that I didn’t like. We played from the whites all three rounds, mostly because we knew we’d get our asses kicked if we went any farther back. There were a few exceptions to this as you’ll see later, but considering I went 91, 95, 91 – playing from the close tees was probably a good decision. That said, all yardages below are from the Gold Tees, which you can’t help but laugh at how far back they are in comparison. Hole 1 (Par 4, 386 yards): Pulling up to the first hole, you can tell you’re in for something special. The scenery is second to none, and with the crisscrossed mowing lines on the bent grass fairways, this is obviously a course for the members – and the lucky few resort guests that get to play (me). I love the first hole. It’s got a slight dogleg left, but is pretty much straight out and warms you up to the course. You’ve got wide landing zones in the fairway, and it’s one of the easiest holes on the property. This doesn’t mean I made it easy on myself, doubling rounds 1 and 2, before playing it perfectly for a par on my final round. Not a bad day for golf eh? Very un-May-like for Oregon. Hole 2 (Par 5, 582 yards): The second hole, ramps things up a little bit, but still keeps it relatively tame. A sweeping dogleg left around a beautiful lake, this is one of my favorite holes on the course. Playing from the whites or the blues, the water comes into play off the drive, and I was within 3 feet of trouble at least once during the weekend. The green is reachable in two, but alas wiser thoughts prevailed as a 220 yard carry over water and pretty much never seemed like a good idea one hole in. An easy layup leaves you with a short approach and a great potential for birdie early in the round. Of course I never really took advantage and went par, triple, bogey. Hole 3 (Par 3, 188 yards): The first of the par 3s, this one is relatively straight forward and probably the easiest. Playing from about 160 yards all weekend from the whites, it jumps back to 188 from the tips. The sand is more than happy to swallow up any errant balls on the right, so if you’re going to miss, miss right – but not too far right. I never embarrassed myself too much on this one, going bogey, bogey, birdie. On the latter, I was tracking for a hole in one, but it stopped about a foot and a half from the pin. Next time. Hole 4 (Par 4, 413 yards): At this point you may have been tricked into thinking this course is pretty easy. All of this changes at 4. It’s worth noting too, that the only set of tees in Oregon more difficult than Gold at Crosswater are the Tournament tees at Bandon Dunes. That’s saying something in a state full of difficult courses. At 4 you have trouble all left in the form of sand and wetlands, and if you slice it too much you’re in the trees right. Should you land the relatively narrow fairway, you’ll be even more scared once you reach your ball, due to the forced carry over wetlands to the most shallow green on the course. Go long? More wetlands. Throw it up there, and hope the pin is on the right hand side of the green. I just kept getting worse here, going par, bogey, triple – with my last two approaches going off the back of the green and getting caught by the rough before flying into the wetlands. Hole 5 (Par 4, 460 yards): The 5th is one of the most scenic holes on the course, with a carry over wetlands and the Deschutes River, and a beautiful view of Mt. Bachelor off to the left. Club selection is vital here, as you’ll end up in the sand long if you go too much, and if you hook it or don’t use enough club you’ll be scrambling to find your lost balls in the river to the left. This is another difficult to hit green with the green bending around the river. Long is better than short here. I went par, double, double. No bueno. On the tee at 5, mountain views everywhere. Hole 6 (Par 5, 635 yards): This is another favorite hole – on a course with nothing but unbelievable holes. You have a long forced carry from all the tees, except the whites (seriously, check out the gold tee box), and then a sharp dogleg left right a creek guarding the green. All three times I didn’t bend my tee shot enough and ended up in the brush past the fairway. Luckily I found my ball every time, but still finished triple, par, bogey. This is another hole that’s totally reachable in two if you hit your drive well. My buddy Nick was 240 out and refused to go for it. I dropped a ball for fun, and landed the green with my three wood. That said, the creek is a little scary, and holding the green is tough with a big trough on the backside. Also worth noting are the two ways routes you can take on the fairway. Go high and you’ll be slightly more elevated and not have to worry about the creek as much, but low is the most direct path. Easily one of my favorite holes on the course. Weather starting to get daunting during our first round. Hole 7 (Par 3, 206 yards): A straight forward par 3 with traps guarding the front of the green, and wetlands to both sides. You’ve got some room to the left to miss, but depending on the pin placement, you could have an ugly chip shot onto the green that’s very difficult to stop. Bogey, bogey, par. Hole 8: (Par 4, 427 yards): One of my favorite things about Crosswater, is that you’re forced to mix it up off the tee. This isn’t a grip it and rip it course, well unless you’re playing from the backs, in which case you have little choice. But 8 is a great example of what I mean. There are wetlands and river just over 200 yards out, forcing you to be smart about your tee shot. I went 5 iron every time, and even with that almost put it in the water. You’ve also got sand all down the right, and brush if you don’t fade it around the fairway a bit. The approach, for as short as it is, is also pretty scary. The river guards the front, and you have sand pretty much all around the relatively shallow green. Double, par, bogey. If you haven’t noticed, not exactly a lot of consistency to my scoring on the course. Hole 9 (Par 4, 456 yards): After a few grueling holes on the middle of the front 9, you get a little reprieve at the halfway point. A straightaway par 4 with water all down the right side. You have a lot of room with your drive, and the green I believe is the largest on the course. It’s MASSIVE. Make sure you check the the pin location and take some extra time on your approach. A 3 or even 4 putt isn’t impossible if you’re on the wrong side of this beast. I went par, bogey, bogey on this one. In our first round, what started as a beautiful day, slowly got a bit scary as the weather came in. Luckily, the rain decided to bypass us, and at the very least we had some cool photo ops. Hole 10 (Par 4, 412 yards): This is another one that requires careful club selection. You’ve got bunkers and wetlands all along the right, and if you bomb it straight you’ll find some brush. The landing area is relatively narrow unless you clear the bunkers on the right, where it opens up a bit. My first two rounds I hit a 3 wood dead straight, landing on top of one of 3 mounds, giving me a bad lie at about 120 to the green. Final round, I bombed a drive that cleared the bunkers on the right and left me with an approach wedge to the green, resulting in a par. Better than the double, and bogey from the previous rounds. Oh and watch out for what’s probably the scariest trap on the course, guarding the entire green. Hole 11 (Par 4, 480 yards): A straight forward par 4, with bunkers all down the left, and one inconvenient bunker straight away near the right – which I almost landed in more than once. A big, undulating green awaits, just be careful not to fly it, as you’ll end up with a steep chip back up and a difficult time pulling off par. Bogey, par, bogey. Hole 12 (Par 5, 687 yards): I don’t know if it officially is, but I’ve got to assume this is the signature hole at Crosswater. It’s unreal. Measuring 687 yards from the Golds, it’s the longest par 5 I’ve ever seen. It’s so long in fact that I had to try and hit from it at least once to see if I could make the carry to the fairway (I could). That being said, this hole isn’t just long, it’s hard. With water running down the entire left side for the duration of the hole, this par 5 makes sure you hit your targets. Oh, and if you think this will make the approach shot any easier, I’ve got news for you – it doesn’t. This was one of my worst scoring holes on the course. Even without losing a ball to the water and hitting some great long shots, I went bogey, double, double. Feeling gutsy? At the 687 yard par 5. Hole 13 (Par 3, 171 yards): A par 3 with a forced carry over nothing but wetlands. This is a beautiful hole, and while it’s one of the easier par 3s, you wouldn’t know it, due to my lack of ability to hit the green. I found the bunker on the back right 2 out 3 rounds. I must have been distracted by the bald eagle hanging out by it’s nest up to the right of the teebox. Seriously though, that was pretty cool. Ok, it may not be the best photo ever, but what, you think I’m gonna carry around a giant telephoto during every round on the off chance I might see a bald eagle? Unlikely. Hole 14 (Par 4, 468 yards): For whatever reason, I had issues with 14 and 15. They were par 4s that weren’t overly difficult, but it could be the fact that it was always late in the round and my mental agility had reached it’s limit on such a beautiful and difficult course. My third time on 14 probably summed it up best: slice, pitch out. Slice, pitch out. Somehow make the bogey putt. Par, bogey, bogey. Hmmm, guess it wasn’t as bad as I thought. For whatever reason the only photo I have of this hole is me chucking my tee after slicing it near the tree line from the tee. I’ll spare you. Hole 15 (Par 4, 414 yards): Don’t go right on this par 4, as there’s a very good chance you’ll be in the sand. If you slice it and somehow miss the sand, you’re going to have a very difficult shot at the green which is heavily guarded by some intimidating bunkers on the right hand side. Stay left all the way, and if you’re feeling gutsy out of the sand or rough on the right, don’t say I didn’t warn you. Bogey, double, double. Hole 16 (Par 5, 598 yards): One of a handful of holes that had me teeing up with my 5 iron, there’s a creek that runs right through the middle of the fairway about 200-260 yards out depending on the tees. If you can get it close enough to the creek on the drive, you have the potential to be on in two, as this another massive green. However more often than not? Layup, take your time on the approach and go for a birdie or easy par. Par, Par, Bogey. Also failed to get a good photo on 16. From the whites you were 204 out, with trouble all left, and a dicey chip over sand if you go right. This was easily my worst scoring hole for the weekend, and I might have been able to make it into the 80s on my last round were it not for an ugly looking double. Bogey, Triple, double. Never hit the green once. Nope, not even close. Hole 18 (Par 4, 456 yards): Remember how early on, I said there were a few tees that I just had to try out? Well, along with 12, the back tees on 18 are another that just beg you to play from them. The gold tees on the 18th at Crosswater are raised on a rock platform, that you have to take a wooden bridge to get out to. Coming in at just over 450 yards, it’s a pretty serious par 4. That being said, I was pretty impressed with my ability to hit the fairway and then drop a 210 yard hybrid onto the green – about 60 feet away from the pin – but on the green nonetheless. This was the hole that kept me from breaking into the 80s during my first round. Triple, bogey, bogey. Yep, hit the fairway on this one too. Maybe I should just play from the tips all the time? It was great playing Cog Hill earlier in the week, but I’ve gotta say my rounds at Crosswater were much more my style. Difficult, but much more playable, and the sand wasn’t nearly as daunting even though there was still a considerable amount of it. Choosing a favorite is tough here, because every hole has something unique and awesome about it. But I’ll see what I can do. Par 3: This is a tossup between 3 and 13. I enjoyed playing three more because I generally played it pretty well, and I liked the front better as a whole than the back. However, between the giant wetland and bald eagle on 13, it’s certainly a unique hole. 13 gets the nod here. Par 4: This was a tough one, because I really liked the combo at 4 and 5. However, I’m gonna go out on a limb and say that 10 is my favorite par 4. I really had to think hard about my club selection, and the hole really rewarded well played shots. Oh, and when you look behind you, you’re treated to one of the most spectacular views on the course. Par 5: The easy answer here is 12. It’s scenic, difficult and unique. However, I keep coming back to #2 as my favorite par 5. It has the risk vs. reward aspect in the sense that it’s reachable in two, but will penalize poorly placed shots. I’m also pretty sure the lone house near the green here would qualify as my dream house. Six is also great as well. Most Unique Characteristic: Just as its name says, you’re crossing water all the time – up to 7 times in a round. And even when you’re not, the course seems to beautifully blend into the property, the wetlands, and the rivers. Oh, not to mention the mountain views from what seems like almost every hole. Perfect for: Anyone that can get on the course. Seriously, even if you’re just drinking a beer and riding in the cart, you can’t not enjoy an afternoon at Crosswater. It’s quite possibly the most scenic course I’ve ever played. It’s also incredibly accessible for everyone from the high handicapper to the tour pro – each set of tees provides a unique challenge. Much more so than most courses, each tee box essentially has you playing a different golf course because of the variety. 18th green with Mt. Bachelor in the background. This was the most no-brainer golf deal I’ve ever seen. $200 for 4 rounds, including 3 on one of the best courses in the country. You better believe that I’ll be back every time they’re offering this deal. Thanks for the great heads up about Crosswater. I’m playing this afternoon and reall6 looking forward to it. Sweet! It’s without a doubt still one of my favorite courses on the planet. Stoked to be getting that same “deal” and be playing this course next week with the “MontanaOpenBoys” we pick a state each year and play some of the better courses of that state. Been following your journey now for awhile on instagram. I am snowteacher…. on IG..